except figs. 11, 17, 18 and 19, which use the 10 µm scale bar. Figs. 1, 2, 7, 8. Lophophaena hispida. IOW 188(F), BSS (no sample ID), BSS 30B(F) EF W51 and BSS 143B(F) EF N30. Figs. 3, 4, 10. Lophophaena butschlii (Cleve). BSS 102B(F) EF L24, BSS 141(F) EF R41, and 141B(F) EF T27. Figs. 5, 6, 11. Lophophaena variabilis. IOW 136(F), BSS 38B(F) EF B38 and 28B(III/432). Figs. 7, 8. Lophophaena hispida Petrushevskaya. Fig. 9. Trisulcus triacanthus. BSS 143B(F) EF 038. Figs. 12-14, 16. Peromelissa thoracites (?). Cp. Arachnocorallium calvata Haeckel -Petrushevskaya 1971, her pl. 70. BSS 26B(F) EF W49, 32B(F) EF Y57, 15B(F) EF K27 and 12113(Q) EF K35. Fig. 15. Peromelissa indet. 27B(F) EF T24. Figs. 17-21. 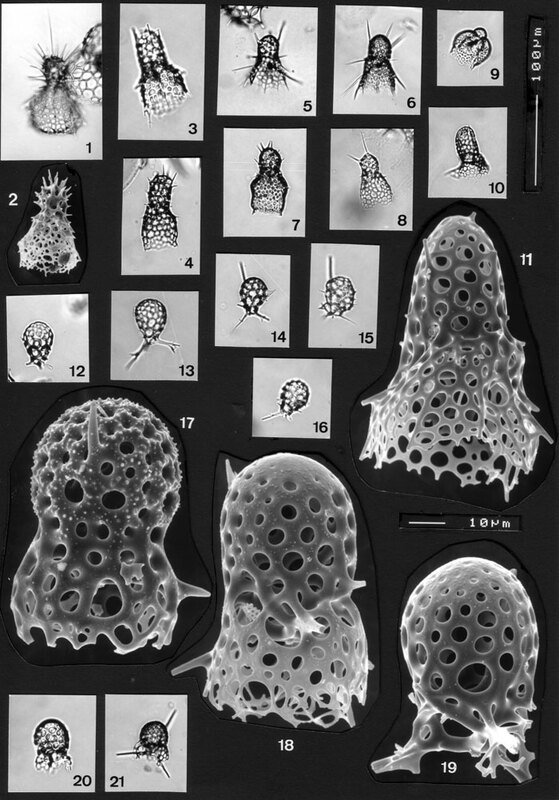 Peromelissa thoracites forma scaphopdium. BSS 28B(III/279, 369 and 398); BSS 121B(Q) EF C20 and BSS 38B(F) EF S36.